I was feeding the boys their dinner when I happen to smell an heavenly aroma hitting my nostrils. Before I could even ask Athamma was it was, I saw a dosa being shoved on the plate I had on hand. I wasn’t about to eat my dinner but as Athamma made dosa for herself she knew I wasn’t going to eat soon. So she made one for with that some spicy powder smeared over it. While still feeding the boys I managed to eat that and couldn’t explain the feeling that came over me. It was that good. 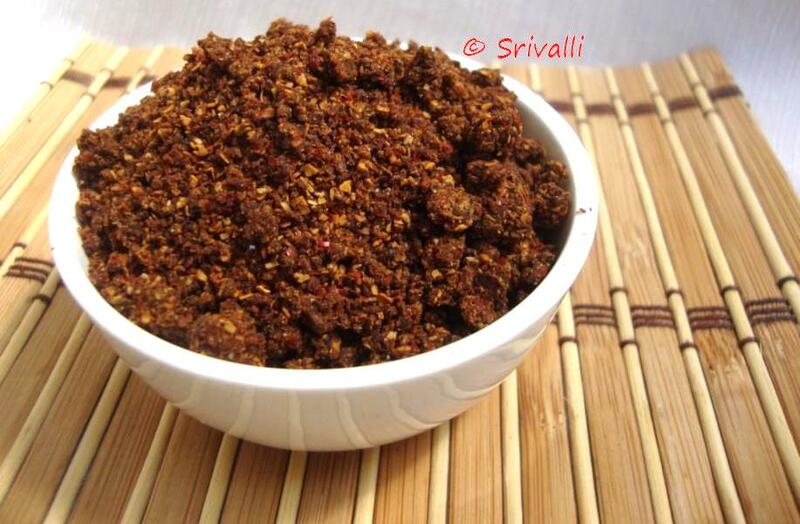 On asking what it was, Athamma sheepishly confessed that it was watermelon seed spice powder. Well I stopped being surprised at what she says. I very well know she is capable of such magic. She is known to make a chutney or a podi with anything you give her. Since it was quite late and that the spice powder got over fast, I couldn’t take a picture. 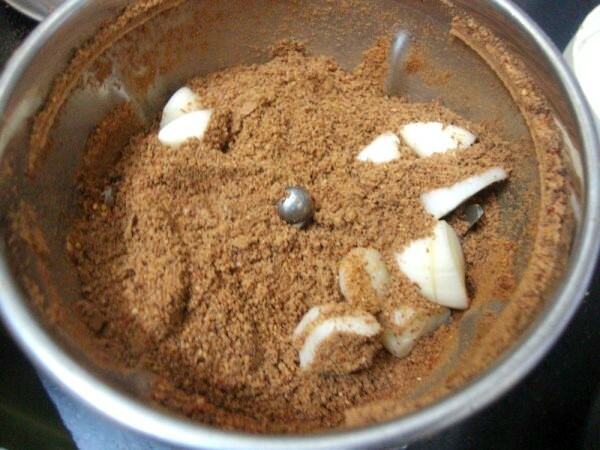 Now that I decided to do condiment for this Marathon, I thought I should make that podi again. Since it’s the watermelon season now, we have been saving up the seeds just for this. We made this batch last night and though I didn’t enjoy with dosa, it was great with Chapati too. It’s only been two days since holidays started for Konda and she is so restless not knowing what to do. And it’s a holiday for the boys because of the election. I will have to rush back to office after casting my vote. Of course the better of the worse gets voted. No choice. Anyway I am planning to make a dosa with this topping soon. You must make it yourself if you want to taste a piece of heaven I talked about. Wash and shade dry the water melon seeds. Else if you get from store you can directly go ahead with the procedure. Heat a pan and dry roast the seeds first. When they are roasted on all sides, remove and keep it aside. Then roast the red chilies and keep it aside. 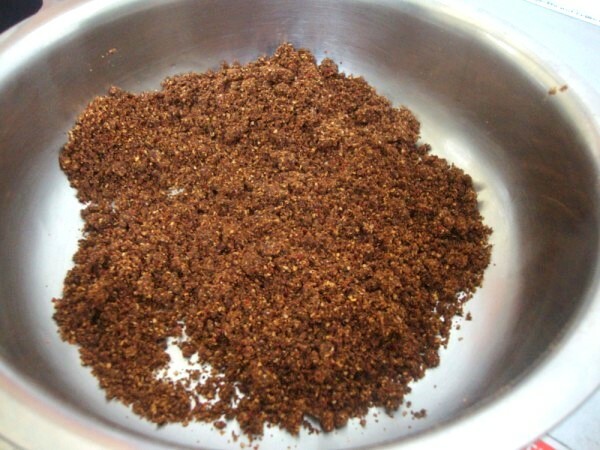 When both seeds and chilies are cooled, take them in a mixer and grind to a fine powder. When it is all done, finally add the peeled chopped garlic cloves. Pulse it well. Remove and add the salt. Spread the powder on a plate for it to get dried. Since you are using garlic, this needs to be dry before storing it. Else it may not stay good for more than couple of days. Best part is, that the aroma is still intact after shade drying the spice powder. 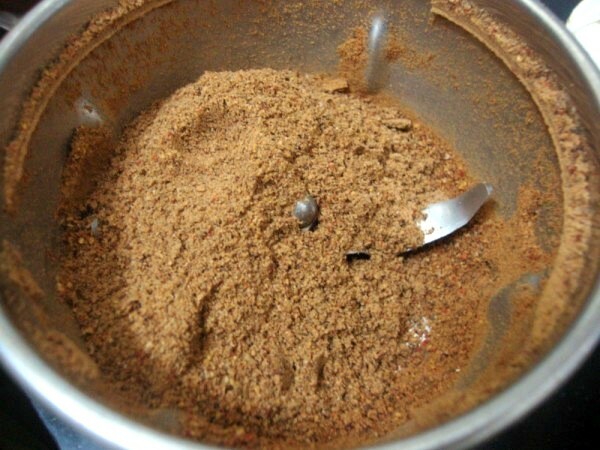 The outer skin need not be removed, but if you are not able to get a very fine powder, you can sieve the podi. Serve with rice or dosas. You can make a paste of this with little ghee and spread over dosa to make spicy dosas. wow! !… this is too good…with watermelon seeds that too!>..I am book marking this…I gotto make it in summer…I am out and out podi fan and new ones are just too tempting for me not to try!…Thanx for sharing Srivalli! Wow! That is really innovative. I don't eat garlic and so need to think of something else for the flavor. 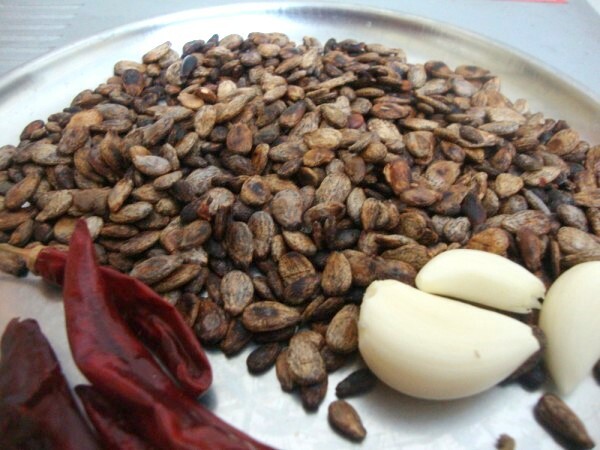 Are you sure it is watermelon seeds and not muskmellon (Karbooz) seeds? Some time back had someone send a recipe for the watermelon skin and now the seeds…it sure is going the coconut way – making use of every part! lovely! Your Athamma is so innovative! Aruna, These are watermelon seeds only..Actually we call watermelon as karbooz only, right now I don't remember what we call muskmelon, maybe dosakayya..:)..Actually we have made a curry and a halwa with the watermelon skin..will be posting them soon..:)..thanks for dropping by..
Wow wat a flavourful podi,actually i have some watemelon seeds in my pantry,also i wanted to make them as spice powder, now i can do them without any hesitation..
Big bow to your athamma….I have to try this podi, now that the season is on! Awesome, this is totally new to me but sounds healthy and delicious! Wow.. what an interesting podi. Never thought you could make podi out of watermelon seeds!! Your athamma is amazing. Hat's off to athamma's efforts..What an innovative spice mix.Just yesterday we finished a watermelon and threw out the seeds.Wish I had saved it but no worries will be getting more tomorrow just to try this spice mix :).Valli, at this rate,I think I will be having jars and jars of spice mixes by the end of BM! Hey this is really innovative. Wait till I make this powder and make hubby dear guess what it is. Will let you know his reaction then. Thanks a million to both Athamma and you. 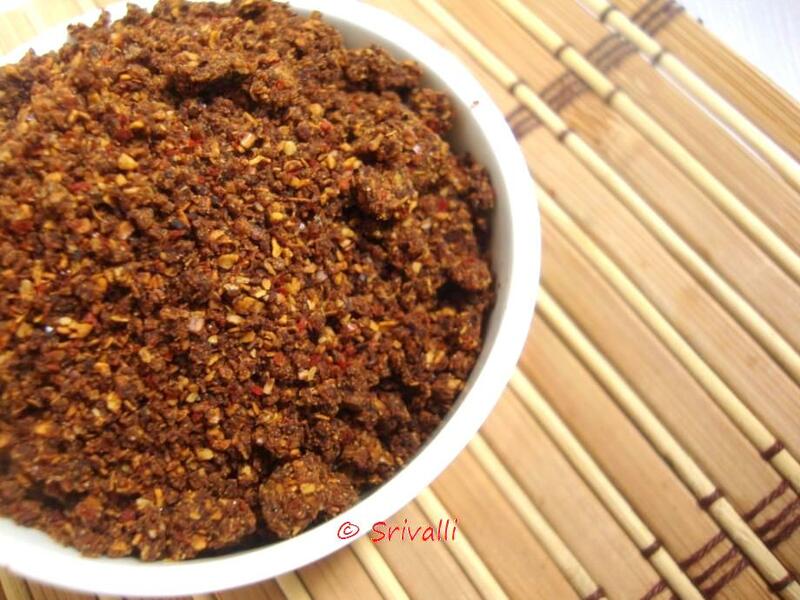 Very interesting recipe Srivalli. How do you think it will be without Garlic. I don't use garlic. Im saving the watermelon seeds to make this ….